Belonging to the family Convolvulaceae, sweet potato is a dicotyledonous plant and is grown in many parts of the world. Apart from being very good for health - as they are rich in carbohydrates - sweet potatoes are extremely delicious. Before you starting making the baked sweet potato chips, you need to make sure that your oven is in working condition. Clean the oven with a dry cloth and preheat it to 200 degrees C.
The next step is to wash your sweet potatoes nicely and make sure that dirt (if any) has been removed. Having rinsed the sweet potatoes, you should now dry them up thoroughly to ensure smoother cutting. You can slice your sweet potatoes according to your preferred size. Many experts recommend that you use a vegetable peeler with half of the batch a knife with the remaining half. Using this way, the slices are likely to come out a little thicker but do not worry because they will be as crispy as the extremely thinner ones. However, these slices will be a lot more substantial and will allow you to enjoy the best flavour. If you are not comfortable with this method, you should look to stick with the technique that suits you the most. 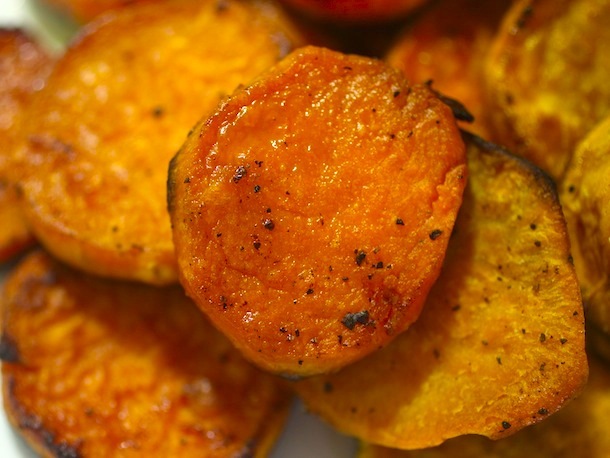 You can now toss the sweet potato slices in a bit of olive oil and spread some salt over them. Place the slices in a baking sheet in a single layer and bake them for approximately 90 to 120 minutes. You may flip the slices a couple of times in between to make sure they are being evenly cooked. Once they are slightly golden and crisp, you may remove them from the oven. However, you should ensure that they are not too dark.